Rahula College will meet St Thomas' College, Matara in their annual football encounter scheduled to commence at 7:10 pm on Friday (July 5) at the German Sri Lanka Football stadium at Uyanwatta, Matara. The Rahula College OBA host this year's game. This is the 12th game in the series and the sixth game to be played under lights. The annual football match first played in 2002 was initiated by Kithsiri Liyanagama and Rathnasiri Suraweera who were the principals of Rahula and St Thomas' at the time together with Premathilaka Hettiarachchi, SP Matara and Jagath Munasinghe of Century Finance Company. The encounter was named the Golden Pennant Football encounter and played for the Century Finance Trophy. St. Thomas' led by M Dhanuka emerged victorious at the inaugural game scoring three goals to two. The Rahula College team was led by Arosha Dissanayake. 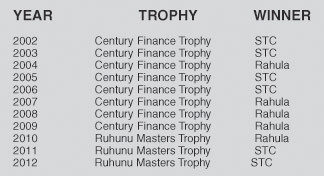 Rahula College carried away the Century Finance trophy in 2009 by winning three years in a row (2007, 2008 and 2009). From 2010 the encounter has been played for the Ruhunu Masters Trophy and Rahula won the first Ruhunu masters Trophy. St Thomas' who won the trophy in 2011 and 2012 will go all out to make it three in row this year and carry away the trophy. St Thomas' lead the series with six wins to five and making it three wins in a row has been eluded the Thomians on two previous occasions. It is to be seen if they will break the hoodoo and bag the trophy home at this third attempt. The Rahula team is led by Ravindu Kaweesha Ediriweera and has Lakshan Kawinda Wimalaguna as his deputy. Bharatha Pathirana, Gavindu Eshan, Kavinga Dilshan, Y W Hewagama, Jayasiri Senarathne, Chamath Gajasinghe, Jalitha Nupehewage, Thushara Brian de Silva, Thisara Wijesekera, Nisal Dilshan, Nuwanga Samarasinghe, Janith Lakpriya, Nimesh Senevirathne, R E Jayawardena, Hasindu Heshan, Rajeeva Methsara, Desitha Hansana, Suresh Jayasanka, Gimhan Karunakarage and Asanka Nayanapriya strengthen the team. Brian Weerappulli is Rahula's coach and Sarath Rupasinghe is the Master In Charge of football. The Thomian team is led by Hareen Shamalka who is also the goal keeper. Ashen Wolith is his deputy while Salindu Sanjana, Ravindu Viraj, Chamal Dinujaya, M R M Rasheen, Dhanusha Madusara, J Y Mihiran, Shashika Dilhara, Ishan Didulantha, Sasindu Ranganth, L Deemantha, G Kaweeshka, Lahiru Muhandiram, Charindu Dasith, M Shahan, Savindu Anjana, Tharushan Kawinda, Pubudu Dilshan and Yasith Shyamal make up the team. K D Lalith is the coach and Manoj Mathangadeera is the Master In Charge of football.